When Giuliana Rancic, long-time host of E! News, first saw her new son, she said it was “the best single moment of my life.” Recently, on the eve of Duke's first birthday, the TV personality and reality star spoke to Dear Doctor magazine about her growing family, her battle with cancer — and the importance of starting her child off with good oral health. “Duke will have his first visit with the dentist very soon, and since he is still a baby, we will make his visit as comfortable as possible,” Giuliana said. That's a good thought — as is the timing of her son's office visit. Her husband Bill (co-star of the couple's Style Network show) agrees. “I think the earlier you can start the checkups, the better,” he said. The American Academy of Pediatric Dentistry concurs. In order to prevent dental problems, the AAPD states, your child should see a dentist when the first tooth appears, or no later than his or her first birthday. But since a child will lose the primary (baby) teeth anyway, is this visit really so important? An age one dental visit is very important because primary teeth have several important roles: Kids rely on them for proper nutrition and speech, and don't usually begin losing them until around age 6. And since they aren't completely gone until around age 12, kids will depend on those “baby teeth” through much of childhood. Plus, they serve as guides for the proper position of the permanent teeth, and are vital to their health. That's why it's so important to care for them properly. One major goal for the age one dental visit is to identify potential dental issues and prevent them from becoming serious problems. For example, your child will be examined for early signs of dental diseases, including baby bottle tooth decay which is a major cause of early childhood caries. Controlling these problems early can help youngsters start on the road to a lifetime of good oral health. Besides screening your child for a number of other dental conditions or developmental problems, and assessing his or her risk for cavities, the age one visit also gives you the opportunity to ask any questions you may have about dental health in these early years. 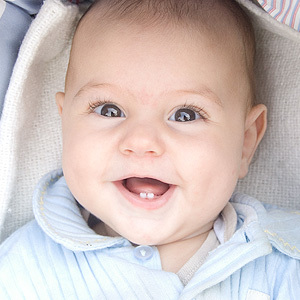 Plus, you can learn the best techniques for effectively cleaning baby's mouth and maintaining peak oral hygiene. To ease your child's way through his or her first dental visit, it helps if you're calm yourself. Try to relax, allow plenty of time, and bring along lots of activities — some favorite toys, games or stuffed animals will add to everyone's comfort level. A healthy snack, drink, and spare diapers (of course) won't go unappreciated. “We'll probably bring some toys and snacks as reinforcements,” said Giuliana of her son's upcoming visit. So take a tip from the Rancics: The age one dental visit is a great way to start your child off right. Learn more about clear braces and whether they are a great option for your smile needs. Clear braces like Invisalign offer a unique way to straighten your smile without worrying about large metal brackets and awkward wires. Instead, those who opt for clear braces only have to pop in their clear aligners, which closely resemble whitening trays, to start getting a straighter smile. Clear braces can improve the appearance of crooked teeth, overcrowding, gaps between teeth and malocclusions (e.g. overbite; crossbite). Once your Waunakee, WI dentist deems you an idea candidate for clear braces, we will take impressions of your upper and lower teeth and then send this to a lab, which will fabricate your own custom-made series of clear braces. After a couple of weeks, your aligners should be complete and ready to be fitted. We will place on your first set of clear braces to make sure everything fits properly. The more often you wear your clear braces, the more effective your treatment will be. Your Waunakee, WI dentist highly recommends that you wear your clear braces about 20 to 22 hours out of the day. Each set of clear aligners will be worn for about two weeks, after which they will be replaced with the next set in your treatment series. The major benefit is that you can gain a straight smile without anyone noticing. The thin, clear plastic used to make your aligners offers a discreet look that no one will see. Furthermore, since you can remove your braces you don’t have to worry about the same restrictions that you would if you wore traditional metal braces. You don’t have to avoid any foods or restrict your diet. Whenever you sit down for meals just remove your aligners, brush your teeth after eating and then put your braces back on. It’s that simple! Want to find out whether Invisalign is right for you? Then call your Waunakee, WI dentist, Dr. Matthew Karls with Karls Family Dentistry and schedule an orthodontic consultation!